Will algae become pig feed? Microalgae extract shows promise as a potential feed ingredient offering several benefits, but more work is needed. Pork producers are being challenged by downstream market chains and consumers to decrease the carbon, land, and water footprints of their production systems. One approach to address this rising challenge is to find new or non-traditional feed ingredients for use in swine diets that have a lower environmental footprint. Because feed is one of the largest contributors to the carbon footprint of pork production, it makes sense to look for alternative feed ingredients that have a lower carbon footprint than traditional ingredients like corn and soybean meal. Some of these possibilities include novel ingredients like single cell proteins, insect meal, recycled human food wastes, and microalgae to name a few. Microalgae are single-celled organisms that have been studied for a wide variety of applications in wastewater remediation and production of biofuels, pigments, bio-fertilizers, and livestock feed among others (Figure 1). These organisms can grow very rapidly by capturing carbon dioxide and sunlight to produce biomass that is rich in nutrients such as carbohydrates, proteins, and fats. Microalgae can be dried and fed to livestock or it can be processed in biorefineries to extract oil and protein for industrial purposes. The remaining components (mainly carbohydrate) may be a source of low cost energy in swine diets. Microalgae carbohydrates have been described as having prebiotic properties with potential health benefits to pigs. To evaluate this possibility, our group recently determined the effects of feeding a microalgae extract on growth performance of nursery pigs. This MAE represented the portion that remained after partial extraction of fat by mechanical methods. We evaluated the MAE in diets fed to pigs throughout the nursery phase beginning at weaning (21 days of age) until 6 weeks post-weaning. Diets in each nursery phase (Phase 1 = 1 to 14 days, Phase 2 = 15 to 28 days, and Phase 3 = 29 to 42 days) contained 0, 1, 5, 10 or 20% MAE. Phase 1 diets contained lactose (20%), soy protein concentrate (15%), dried whey (5.5%) and fish meal (5%) in addition to corn and soybean meal. Phase 2 diets contained these same high quality ingredients but at lower concentrations. The MAE was included in diets as a partial replacement for corn. 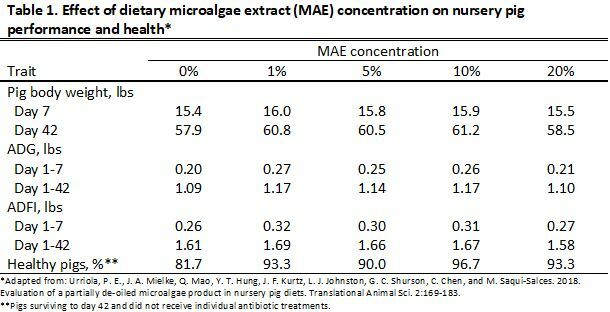 The low dietary levels of MAE (1 and 5%) were included to evaluate possible prebiotic effects of microalgae in the gut of weaned pigs. The high dietary levels (10 and 20%) were included to evaluate the utility of MAE as a significant source of energy and nutrients in nursery diets. Growth performance of pigs improved with the addition of MAE to diets (Table 1). Body weights of pigs fed the 1%, 5%, and 10% MAE diets were 2.6 to 3.3 pounds greater than pigs fed the control diet at the end of the nursery period. Most of this increased body weight was realized during the first seven days of the experiment. The increased body weight with low to moderate concentrations of dietary MAE (1 to 10%) was due to improved daily weight gain and increased daily feed intake, which also occurred early in the nursery period. An interesting finding was that pigs fed the highest level of MAE (20%) performed similar to pigs fed no MAE. This suggests that moderate dietary concentrations of MAE (1 to 10%) may enhance pig growth performance, but higher dietary levels (up to 20%) will support pig performance similar to corn-soybean meal based diets. Another important observation in this study was that the flowability of the meal diets fed in this experiment progressively declined as MAE concentration increased. In fact, the poor handling characteristics of the 20% MAE diet created challenges to ensure that feed flowed through feeders and was readily accessible to pigs. 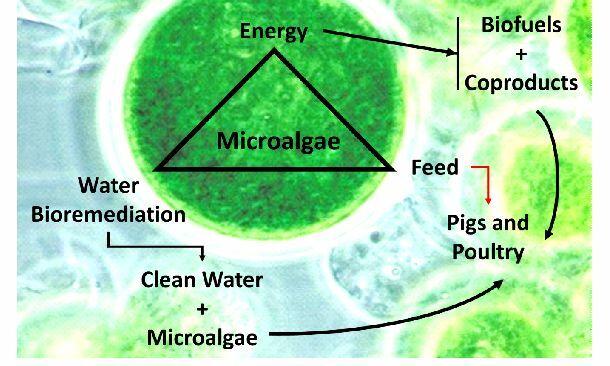 Growth and pig performance improved with micro algae added to diets. Pigs experienced some coughing and diarrhea during the second week of the experiment, which resulted in the need to treat all pigs with neomycin (22 mg/kg BW) in drinking water for seven days. Eighteen additional pigs received individual antibiotic injections to combat persistent coughing and gaunt appearance. Interestingly, the incidence of individual treatments and mortality in pigs fed MAE tended to be less than those fed the control diets that contained no MAE. These data provide some suggestion that MAE may be useful to improve health and survival of health-challenged pigs. The extracted microalgae product evaluated in this experiment had adequate energy and digestible nutrient content to support acceptable growth performance and health of nursery pigs. In fact, feeding MAE may be beneficial in reducing mortality in health-challenged pigs. Furthermore, microalgae have potential to serve as a feed ingredient that can be used to reduce the carbon footprint and improve the environmental sustainability of modern pork production systems. However, there are thousands of species of microalgae that respond to growing conditions in multiple ways which affects their nutrient composition and potential use as feed ingredients. As a result, additional studies are needed to further evaluate the potential use of microalgae species and microalgae co-products in swine diets.